Aerial view flying hotel by sea tropical lagoon towards, amazing sand beach, away white clouds on the mountains, green pines forest, relax resort Pitsunda on Abkhazia. 4k00:07Flying drone coastal zone, beach resort of Pitsunda pines on the shore of Abkhazia. Aerial view on resort town of Pitsunda Aerial footage tropical lagoon, waves and sandy beach. 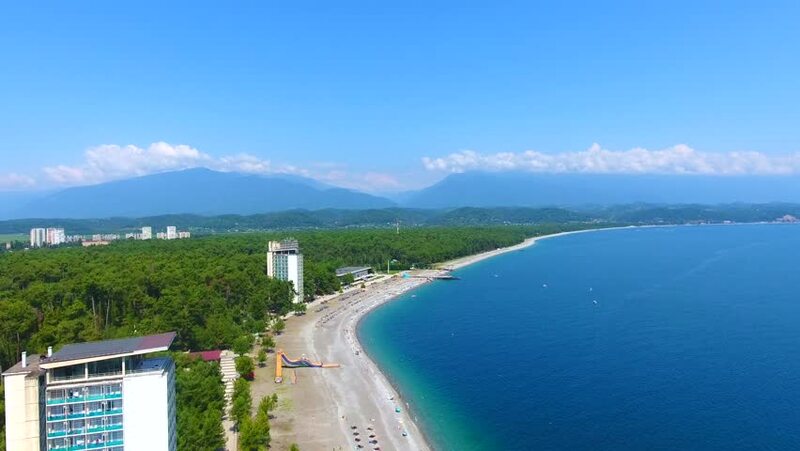 4k00:11Aerial: coastline in blue bay is a beach hotel with umbrellas in amazing sand beach, green pines forest, relax resort Pitsunda on Abkhazia.